In today's complex → new economy driven by knowledge and → systemic innovation, cross-functionally excellent business architects are in growing demand. By building your cross-functional excellence, you'll be able to tie several silos of business development expertise together, create → synergies, → lead people who will put their plans into action, and ultimately build a winning synergistically integrated organization. 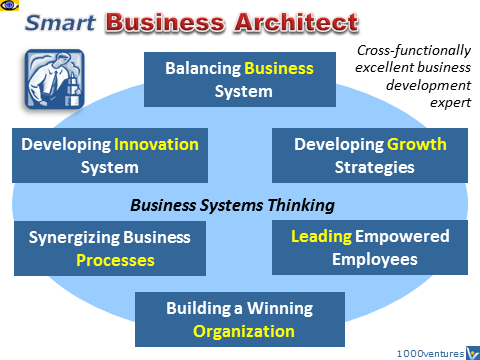 To perform task of a business architect, you'll need to possess the following competencies. Patterns or connections between situations that are not obviously related. Excellent → leadership, → teambuilding, → communication, → presentation, and → negotiation skills. 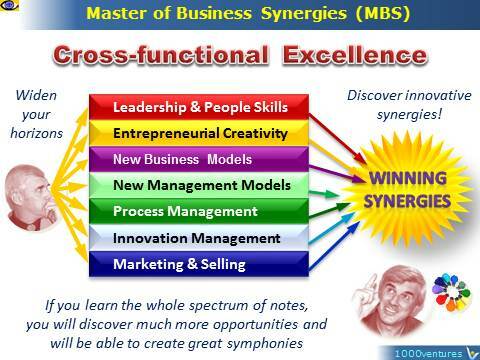 The integrated business systems approach to business development and the management process is what distinguishes modern cross-functionally excellent business architects from functional managers. As a business architect and an extremely effective leader, you must have a broad view to be able to link together – synergistically! – the key components of corporate success – from functional planning to cross-functional cooperation, from supply chain management to customer value creation, from the art of continuous learning → learning to the practice of effective communication and → influencing people – and bundle them in an intellectual, innovative and pragmatic package that can be used to achieve sustainable competitive advantage and business growth, both top-line and bottom-line. "Many managers fail to see the forest for the trees. This is not an either/or problem. The trick is to see both the forest and the trees. Systems thinking is a methodology for doing both simultaneously. It's more than a methodology, it's like learning a new language and takes nearly as long as learning a foreign language to achieve maturity," says Jim Botkin, the author of Smart Business. The goal of systems thinking is to manage the rapidly growing complexity of the worlds of business and technology. The task of a business architect and a process manager is to create systems, within a sensibly structured business, that empowers employees and enables people to achieve higher productivity and greater competitive advantage. Systems thinking characterizes many of the world's leading executives. It is a formal discipline of management science that deals with the whole business system and in terms of the interconnections and interactions of its parts. If your business is in flames, stop what you are doing, quiet your mind and take a bird's-eye view of your business. Drop any misconceptions you may have as to what you should be doing, and then re-balance your business. As you regain the balance in your business, you will regain control.